Thanks to Randy Shaw for his generous and thoughtful review of my A Community Organizer’s Tale: People and Power in San Francisco. I hope there is a forum for the discussion he calls for, and I’d like to take issue with some of the critical points he raises: Shaw thinks I ignore the “profoundly conflicting interests” that were “the people” of the Mission: “The fact is that ‘the people’ of the Mission have conflicting interests that prevent their harmonious membership in a single organization.” There were no Wall Street bankers, multi-national corporate executives, major developers or other “downtown” interests with any voice in the MCO; nor were there any major politicians or political parties. Rather, there were the voices of moderate or conservative residents who thought you had to be nice to those in power in order to get things from them; they were a minority, and they learned. The majority came increasingly to understand that people power is the necessary lubricant for social and economic justice. Otherwise, MCO was filled with conflicting interests: elderly people who wanted more police presence in the neighborhood and militant youth who wanted, as the saying went in those days, to “off the pig;” building trades workers who wanted construction jobs and residents, small businesspeople and local institutions who were afraid of urban renewal; teachers union members who opposed community control of schools and education reform advocates who favored it. Rather there was a continuing process of give-and-take, compromise, search for synthesis, and introduction into the organization of new constituencies whose presence and problems opened the eyes of those more moderate parts of the community to such issues as: cheating merchants, rip-off lawyers and others who took advantage of immigrants, cops who didn’t respect local youth, landlords whose high rents were matched by low service, and more. MCO, Shaw proposes, would have fallen apart “as rising rents in the mid to late 1970’s sparked calls for rent control. MCO could not have survived internal conflicts between its landlord and tenant members.” Quite the contrary: MCO was increasingly effective at organizing tenants and negotiating agreements on rents, maintenance, and treatment of tenants by landlords. But it was interested in justice, and didn’t assume tenants were always right. When an occasional landlord came to the Housing Committee with a legitimate complaint about tenants who weren’t paying their rent or were destroying their apartment, MCO took that landlord’s side. There weren’t a lot of those cases, but the fact that they existed contributed to MCO’s neighborhood reputation of fairness. More importantly, MCO learned about red-lining when one landlord explained that he couldn’t repair his property because Bayview Federal Savings & Loan Company wouldn’t give him a loan. MCO now made allies of the tenants and their landlord and confronted the lender. It capitulated. 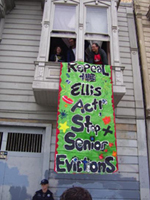 This problem was the same problem that faced the tenant movement in New York City. When I asked one of its leaders what had happened to it, he told me the answer was simple: “The leaders became boards of directors; the organizers became executive directors and program staff; the members became clients.” That says it all. Self-perpetuating nonprofit boards of directors, operating programs totally dependent on external grants and appropriations, replaced elected leadership bodies, active memberships and large-scale public action. While MCO didn’t officially back Mayor Alioto, Shaw is right pointing out that most of its major leaders (though not all of them by any means) did. But he implies it was because of Alioto’s pro-development policies. Quite the contrary. MCO leaders were deeply suspicious of “liberal” Jack Morrison because he supported urban renewal in the earlier 1965-1967 fight that was won by MCO’s precursor, the Mission Council on Redevelopment (MCOR). Alioto, in fact, made clear that he didn’t have an urban renewal agenda for the Mission when he granted the neighborhood “community control” of the Model Cities program. Shaw wasn’t here then, so you can’t blame him for not knowing that history. But ask most people in the Mission who were in the urban renewal struggle and you’ll hear suspicion of Jack Morrison. Fortunately, other liberals on the Board of Supervisors, joined by some conservatives, defeated Justin Herman’s Redevelopment Agency twice by 6-5 majorities. In fact, more than in any other neighborhood in San Francisco, the Mission slowed speculation because it created, as one developer told me, “an atmosphere inhospitable to development.” He thought that would get me to reconsider our direct action, rent strikes, job sit-ins and other militant expressions of people power. He was wrong: no greater compliment could have been paid me as an organizer. Public policy and elected officials are simply not the same as people power. And I don’t really think Shaw intends that, though I think he says it. He writes too positively and too often about progressive unions for one to believe that. Had MCO continued as a people power organization it would have supported good policy measures, and decent political candidates. But it would have also made sure that landlords who intimidated or otherwise pressured tenants to move out were checked by militant and effective action against them.